Dr Jengo's World: Mark the date, GTA Online Heists are coming on March 10. Mark the date, GTA Online Heists are coming on March 10. We finally have a date! March 10. 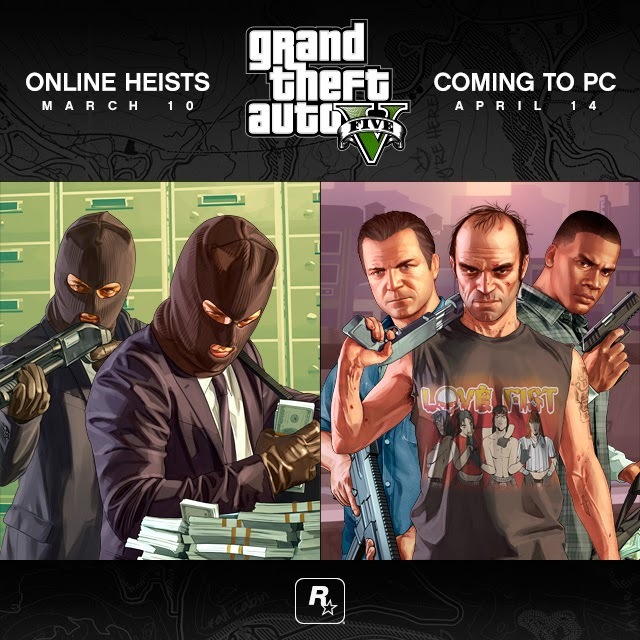 Mark your calendars, set a reminder, scribble on your notebook or do whatever you do to remember appointments.. Online Heists are coming to GTA..
Oh yea.. and PC Gamers, set another date, April 14 where GTA comes to your platforms. May the modding begin!! Can't wait to see those mods that people come up with. It's been a damn long wait, to the point it has become a joke but this is Rockstar. They never disappoint. Sure, I may have some complaints about the way GTA Online turned out, but it was and still is an epic game on it's own. With so many games these days, coming up with payable DLC for redundant stuff like gun skins & horse armour.. 'Heists' is actually a 100% free DLC! Mortal Kombat X Brutalities showcased! Spawn in Mortal Kombat X? Heroes of the Storm figures from NECA.